Mercury Racing's OptiMax JP: Mercury marine's jet fuel burning outboard motor. Its cowling features a stealth flat black finish with tone-on-tone graphics. Also notice the Fleet Master gearcase. 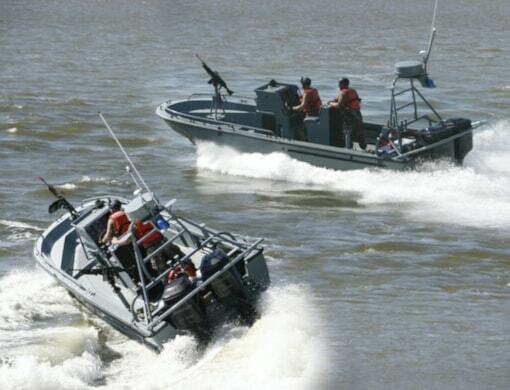 Transportable Port Security Boats, designed to fit in the cargo bay of a C-130 aircraft, and based on a 25-foot Boston Whaler, are manufactured by Brunswick Commercial and Government Products in Edgewater, Florida. The motors are of course Opti JPs. Mercury Racing custom builds an alternative fuel/mulit-fuel outboard motor for the US Military. Built in Fond du Lac, Wisconsin, the 185-horsepower engine is based on the Mercury Racing OptiMax 250XS. Optimax outboards are renowned as low emissions engines that burn significantly less fuel than their conventional two-stroke counterparts. OptiMax JP is a direct-injected 3.0 Liter V-6 that burns JP-5, JP-8 or Commercial Jet-A fuel. It runs smoke free, and boasts up to 40% better fuel efficiency than its gasoline counterpart. OptiMax JP has a different compression ratio than the civilian OptiMax 250XS. Also, because of carbon deposits, the military motor is fitted with with special pistons, rings and cylinder heads designed to tolerate jet fuels. Also, Mercury developed a special JP outboard oil, with additional dispersant additives, that are mandatory in the OptiMax JP. Its high-performance cylinder liners feature race-derived transfer and exhaust ports with hand-ground boost ports for increased power and performance. The build list includes custom pistons and O-ring cylinder heads, with special combustion chambers. High performance rubber coated reed blocks cushion the impact of the five-petal, single stage carbon fiber reeds, which enhances reed life without sacrificing performance. OptiMax direct injection is a proprietary 2-stage process. A 95 psi burst of air shoots shatters the fuel charge, breaking it into a fine mist. This fine mist creates more surface area, exposing more fuel molecules to oxygen. that pays big dividends in a more consistent and complete burn. OptiMax JP gets its marching orders from the Mercury PCM 03 microprocessor and state-of-the-art SmartCraft Control Area Network (CAN) system. The PCM manages fuel flow and ignition timing to each individual cylinder. Built tough, Mercury Racing’s heavy-duty Fleet Master gearcase comes standard on al JP OptiMax models. Fleet Master gear housings feature dual water pickups for additional water flow and cooling while reducing ingestion of weeds. One of the models will be fitted with a jet drive for shallow water operation. Genesis for this new power option was a Department of Defense directive mandating the elimination of gasoline stored on board ships or on aircraft. Why kerosene-based Jet Propellant fuels? The answer is as simple as the sea is salt. JP-5 was developed by the U.S. Navy to reduce the risk of fire onboard its aircraft carriers. JP-5 is jet fuel with a high flashpoint (more than 140 degrees F). JP-8 is a similar U.S. Air Force blend. Because both JP-5 and JP-8 are significantly less flammable, they are a better choice of fuel for safety and combat survivability. JP is also abundant in the fleet supply line. In an emergency situation when JP fuels are not readily available, the JP OptiMax can also burn gasoline or diesel fuel for a short period of time. OptiMax JP engines deploy worldwide with units of all the Armed Forces, including Special Operation Detachments. Bore X Stroke 3.63" x 3.00"
Transom height 25" or 30"